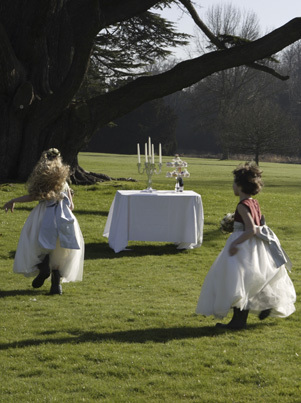 Our Collections » Bespoke flowergirls » Don’t worry, we’ve got our wellies on! Don’t worry, we’ve got our wellies on! Our bespoke service ensures that a bride’s vision is truly realised. You can choose from a huge range of exquisite fabrics and colours and working closely with Nicki, create nothing short of a dream! We spend time getting to know you, as well as your personal style and ideas, to create a spectacular and unique design for your flower girl or girls.